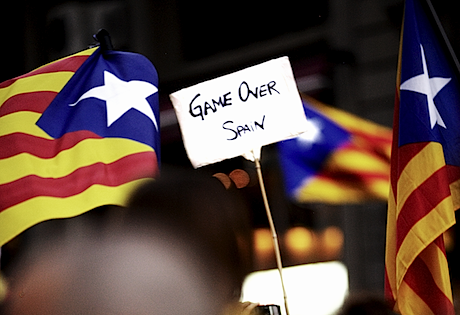 The independentist inclinations of Catalonia, Scotland or Flanders define a dominant political zeitgeist in Europe – the dismantling of large territorial units. And this is why they will ultimately succeed. During a pro-independence demonstration in Barcelona this September. Demotix/Patrick Muzart-Lupinacci. All rights reserved. Writing almost 100 years ago, an advocate for Yugoslav unity asserted that the “creation of a Yugoslav nation is for us the logical conclusion to a long historical process, which leads inevitably to the unification of groups related by blood.” Bearing in mind the unification of the modern Italian and German states (in 1861 and 1871 respectively), it must have indeed seemed “inevitable” to this author that the various South Slavs would amalgamate into a single nation despite their three different religions, multiple dialects and varied histories. Since the late 1980s a similarly positioned observer might well have claimed the opposite; large amalgamations, either ones based on ideology like the USSR, or on the union of “groups related by blood” (Czechoslovakia, Yugoslavia and now perhaps Spain, and Great Britain) would seem “inevitably” on the path to fissioning into smaller units. Perhaps there is no universal law governing tendencies to fusion or fission, but rather a context, which makes one or the other outcome more likely. In the case of nineteenth and early twentieth century Europe, the context favored amalgamation, whereas now the opposite appears true. Why? State formation is an elite led political process, so in order to understand what drives state fission or fusion, it makes sense to consider elite attitudes. One law that does seem generally applicable is that for a politician or a political group, sovereign control over a smaller amount of territory or people is preferable to sharing power over a larger group (call it the big fish in a small pond rule). For politicians, then, fission is preferable to fusion. However, there have traditionally been strong limiting factors in the realms of security and economics on the viability of small units. First and foremost, political units potentially need to defend themselves militarily from their neighbors; second, in the pre-contemporary world, an internal economy of a certain size was necessary to allow individual states to create economies of scale and fend off the potential economic protectionism of their neighbors. Finally, insofar as European states had imperial ambitions, larger size was required to generate the manpower to realize them. Taken together, these elements created, by accident rather than design, a balance between the desires of elites to run their own show and their need to join with others to achieve safety in numbers or realize larger scale ambitions. What we see in Europe today, however, is a changed ecosystem, which produces different incentives and results. Most important, metaphorically speaking, predators have been removed from the ecosystem. It is no longer necessary for a European state to worry about defending itself from the potential depredations of its neighbors because these neighbors have abandoned the desire to engage in warfare among themselves. As for extra-European threats, they are to be handled by supra-national NATO. Furthermore, insofar as the Eurozone functions as a supra-national economy, there is no longer any need for a European state to have a large internal economy. If it can find a niche within the larger Eurozone, it is protected from the kinds of economic warfare that once plagued smaller states (unfair tariff regimes, inability to access markets and so forth). Finally, the EU has also enshrined a process of decentralization, which has given local elites both more experience in handling their own affairs than they had in more centralized nation states and more of a conviction that they do not need the politicians in the center. While each of these tendencies is a good thing in principle, taken altogether they have produced a perfect storm for separatist movements. With no fear of attack by predators, economic or military, and solid experience in political and administrative activity, sub-national elites recognize that there is currently very little in the way of a brake on their desire, which was always present but was earlier by necessity suppressed, to run their own sovereign show. Why, from the perspective of a well-educated and politically ambitious leader from Catalonia, or Scotland, or Flanders, should I be the deputy prime minister of Spain, Great Britain, or Belgium, when I can be the Prime Minister of my own country? Why not get to drive around in that limousine with the flags on the front, get my photo op with Barack Obama, lead the Olympic delegation, speak at the UN, and so forth? In any case, “my people” (it is easier to define “my people” in Europe if they speak a distinctive language since language and nationhood have historically been linked there, but, as the Scots are proving, even a separate language is not required as long as one has some logical organizing unit to point to) are already, in many respects, governed by us. Why not just make it official? In times of economic crisis, these issues are likely to surface ever more strongly, not because normal Catalans are more inclined to separatism than they were before, but because financial cooptation, the one last glue holding potentially separatist regions to the center, disappears. As long as the nation state government had sufficient resources to co-opt at least some local politicians, their desire to be big fish could be tamped down. In the absence of such resources, it surfaces with a vengeance. Despite their frequently expressed desires to do everything possible to prevent separatist movements from seceding, European nation states do not have many options at their disposal. Neither Spain, nor Great Britain, nor Belgium will send out the army to prevent secession. And given that the EU, for all its lack of desire to continually add new members, would be hard pressed to turn away an independent Catalonia, or Scotland, or Flanders should their populations vote clearly for national sovereignty, it seems likely that for now fission will continue. Catalonia and Scotland will secede, Belgium will break up. So, can we expect to see independent Basquia, Südtirol, Friulia, and Istria down the road? Probably not, because at some point the context will change, making it again too dangerous or difficult for local elites to achieve their inherent desires for sovereignty. What the trigger for that might be and when it will appear is hard to say. But for now, it is probably not a good idea to invest heavily in printed copies of current European political maps.